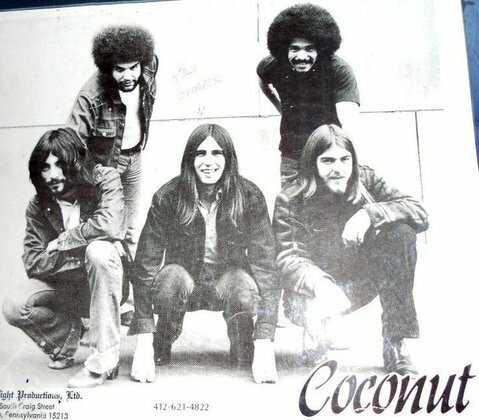 Coconut were a highly regarded and very popular band in NE Ohio. The band originated in the Warren/Youngstown area but played in Cleveland and Akron/Kent a lot. The original band included Gary Markasky (guitar), Bill Colentone (guitar, vocals), Jose Ortiz (drums), and Mike Joyce (bass). Coconut played a lot of soul and funk covers, getting a lot of dancers, which made them a popular choice for fans and club owners. Over time personnel changed to include Mike Soffos on bass (formerly of Blues, Inc), Pete Pylipiw (keyboards), Steve Lawrence (drums), and later, Dave Thomas (keyboards). In 1975 the band changed many of the members, with Myron Grombacher playing drums (replacing Lawrence), and Bill "B.E." Taylor, from Alliquippa, PA, joining on vocals. Another PA musician, Hermie Graniti, was the keyboard player for the last version of Coconut, with Gary Markasky being the only original member. Although the band was very popular, they never released a record, there may have been some demo recordings done. After they broke up, Gary Markasky joined the Michael Stanley Band. B.E. Taylor was in several prominent bands from the Pittsburgh area, as was Hermie Granati. Myron Grombacher joined Pat Benetar's band in the 1980s (with Clevelander Neil Giraldo). Jose Ortiz joined I Don't Care. Mike Soffos and B.E. Taylor are deceased.